On 21 July, around 70 of Johannesburg’s women entrepreneurs representing all sectors of business and industry, gathered for a morning of inspirational startup story sharing and great networking at the latest in the highly successful series of Lioness Lean In Breakfast events. 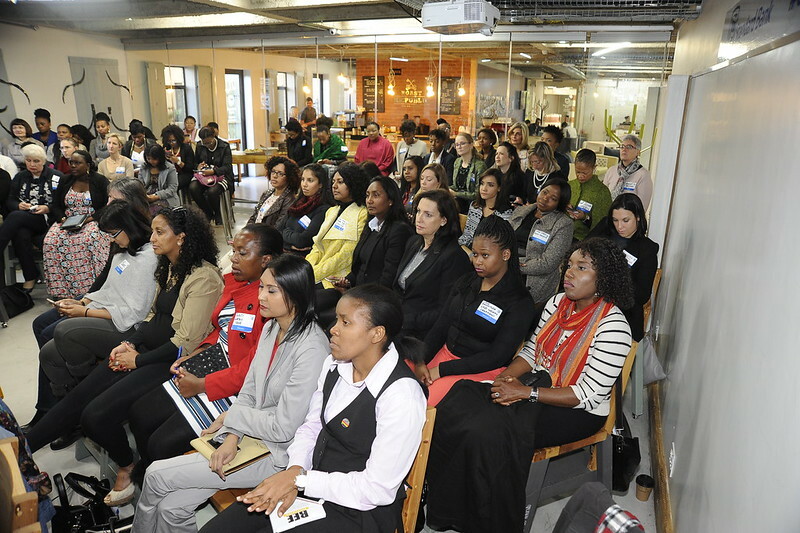 As always in this popular Lioness Lean In destination, the event took place in the city’s Rosebank district at the Standard Bank Business Incubator in Rosebank, where the surroundings create a great entrepreneurial vibe for all those attending. The Lioness Lean In Breakfast events are proving to be a huge hit with women entrepreneurs who come from across the country to listen to other successful women business brand builders share their stories and to network. On arrival, the attendees immediately got on with the main business of the morning, enjoying breakfast created by the ever popular entrepreneurial team at Roast Republic, and of course, networking - lots of it! VIDEO: Get into the Lioness Lean In spirit by watching the highlights of our event held in Johannesburg on 21 July at the Standard Bank Incubator in Rosebank, Johannesburg, South Africa. The morning’s programme was launched by Lionesses of Africa founder and ceo, Melanie Hawken, who got the event underway by encouraging every woman entrepreneur in the room to make at least one new business connection during the morning, with an impromptu 30 second business card swop session to kickstart proceedings. The first speaker to be welcomed to the podium was Johannesburg-based entrepreneur, Tania Reid, founder of Ithemba Office Solutions, a business concierge business. She provided the audience with a frank story of how she has built her business over the past six years, battling numerous challenges along the way, and sharing those learnings with others. Her approach was refreshing and demonstrated the tenacity and resilience needed by women entrepreneurs in Africa who are looking to build and sustain businesses in tough economic conditions. Continuing Lionesses of Africa’s support for the global #ChooseArtisan campaign, next to share her story was Frances Edwards, founder of the luxury handcrafted South African shoe design company, House of Cinnamon. She gave an insight into the very specific challenges of building a luxury brand in Africa and one that is focused on high quality craftsmanship requiring specific skills and training. The range of beautiful shoes she brought along with her to show to the audience won fans immediately for her work and her brand, demonstrating that there is a real appreciation for genuinely handcrafted and proudly African-made and designed products in the marketplace. Farai Simoyi, founder, Farai Inc. The final guest speaker for the morning was a genuinely global brand builder, having flown into South Africa from her base in the US. The highly talented international fashion designer, Farai Simoyi, founder of the fashion brand Farai, originally hails from Zimbabwe but now calls New York home. She entertained the audience with her highly original and inspirational startup story, which saw her career starting with designing for iconic musician-led brands such as Beyonce’s Dereon fashion brand, JayZee’s denim brand, and Nicky Minaj’s fashion label, before she went on to launch her own unique fashion brand Farai. She shared some incredible learnings with the audience from her time designing for these major music and fashion icons, all of whom understand and harness the power of linking personal brand with business brands. Wrapping up the event was a familiar face to the Lioness Lean In Breakfast series, Jayshree Naidoo, Head of the Standard Bank Business Incubator and a passionate supporter of women entrepreneurs across the African continent. Jayshree shared a story of how the bank has supported, and continues to support, high potential young entrepreneurs such as the highly successful Thato Kgatlhanye, founder of Rethaka Trading and the creator of the life-changing Repurpose Schoolbags for South Africa’s schoolchildren. Jayshree also shared her insights into what the bank is doing through its Incubator to empower and support women entrepreneurs. Checkout and download photos from the event photo gallery.